In Soviet times, a bag worn with almost every. What were his reasons. In the era of scarcity of everything, it was impossible to know in advance that they will be able to buy in the store. The usual modern buyer plastic bags were a luxury, so makes sense to always carry a lightweight compact grid. Now the bag is experiencing a new life. It is used many times, it is not necessary to be disposed of. In addition, related from beautiful modern materials of a bag can be a showy addition to the summer dress. Prepare for netting. Need to stock up on a special hook and flat stick. The Shuttle can be bought in some shops trading in the goods for fishing. The bag is woven in exactly the same way as a fishing net. If desired, the Shuttle can be done by from a piece of wood. The length of the Shuttle 20 to 25 cm, the middle of it like a knitting needle, and the ends flattened and cut. The wand resembles a spatula, which looking throat. The wider the stick, the bigger will be the cell. Wrap the thread to the Shuttle. There should be a sufficient amount to bind with a majority of the grid. At the same time, the layer of thread should not be much thicker flattened parts of the canoe, otherwise it will be difficult to pass into cells. Attach to the edge of the Desk, hook or hammer a nail in there. You can also use the back of a chair, if it has the slim projecting parts. Cut twenty centimeters thin rope and tie the rope into the ring. Ring wear on the nail. Attach to the ring end of the thread from the Shuttle. Take the Shuttle in right hand and wand in left. Hold the wand horizontally, the thumb, index and ring fingers of the left hand. Place the thread from the hook on the stick and wrap it around the index, middle and ring fingers of the left hand. Lift the thread upward so that it covered the index fingers of both hands. Flip her on her left side and press to stick the thumb of the left hand. Slide the thread right to the bottom of the sticks. The Shuttle swipe through the existing loop of yarn. Reach floss-tip and middle and ring fingers. Push the Shuttle forward, push it through the auxiliary loop. Pull the thread until it will not stretch and will not cling to the finger. Pull the thread further, freeing alternately large, middle and index fingers. Pull the thread, pulling the wand to the auxiliary loop. The index finger presses the filament to stick. Tie another loop. Turn the work and knit thus 25-29 rows. You should now have a long narrow strip, the cells of which are arranged in a staggered manner. Pull the auxiliary loop. Rotate the work horizontally and route the cord into the cells one row (if you count the cells in a row, you get through one). Thread prodelyvat closer to cells of the second row. Associate auxiliary thread into the loop and again hang it on a nail. Tie the bottom of the bags. Weave the first 2 rows of 12-14 loops on one side of the bag, Unplug the cord and thread it into the cell, remain free. Take 2 exactly the same number on the other side. Untie the auxiliary loop. When vyvazhivanii the first loop in each row stick stretch in the last cell of the previous row. Fold the mesh in half on the cord. One part was longer than the other. Turn the bag so that the shorter part is in front of you. It will be the bottom of the bags. Again cable auxiliary cord to the nail. Then spin the mesh around the circle, putting on the stick as many cells as it is placed. Spin the bag to the desired length. In the last row, replace the wand on a wider weave and a number of longer cells..
Weave handles. The classic shopping bag two of them. Fold the thread in 5-6 layers desired length by adding 4-5 cm to mount on each side. In the place of fastening of a tie warp thread of a ball. Take a basis in the left hand and the ball in the right. Guide the thread from the coil on the core, cover it, slide under the base and enter the front of the resulting loop. Get something like a hinge joint. Tie so the whole handle, then make a second Bind the handles to the grid. The knots which fastened the cell string bags, can be arbitrary. The main thing that they were hard and didn't spread. 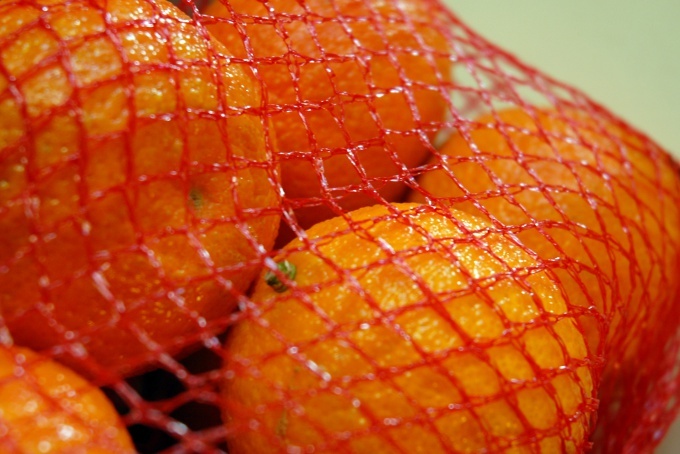 For shopping bags, you can use colored synthetic twine. For weaving you can use the Shuttle for tatting, but it is less convenient. It is better to weave lace decorative bag. The handles are crochet or weave macramé.